First off, thanks to everyone who entered, tweeted, retweeted and all that fun stuff! Congrats to the winner of A TOUCH MORBID, THE GODDESS TEST, and SIRENZ! Feel free to email me at scottshouldbewriting at gmail dot com with your mailing address, Cait! To enter the Morbid kind of Magic contest! All the information can be found here. 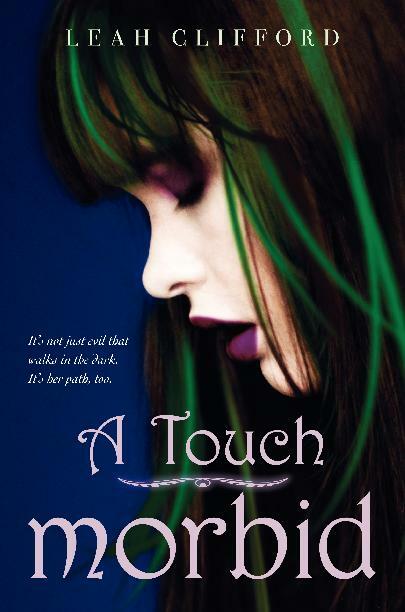 And trust me, you WANT a copy of A TOUCH MORBID – it’s so good! All you have to do is take a picture with a copy of WITCH EYES and you’re entered! And I promise to do real blog entries again soon. I’ve been rather uninspired lately. I’m super excited to keep working with Flux, and to get to keep telling Braden’s story. I can’t tell you too much about PHANTOM EYES yet, but I’m definitely stoked to write it. And you can tell that that’s the truth, because I used the word “stoked.” Serious writer business, people. See this? This is A TOUCH MORBID, by Leah Clifford. And I have an ARC of it. Want it? And some other special prizes? Then this is a contest for you. The rules are simple. Second, this contest is open to the US/Canada only. To Enter: Take a picture of yourself with a copy of WITCH EYES. This has to be an actual copy of the novel (sorry but a picture of it on your ereader doesn’t count), and it can either be a copy of you and the novel in the wild, or it can be you and the book in a bookstore. Post the picture somewhere (Facebook, twitpic, wherever), and then add a comment to this post with a link to the picture. If you’re posting on Facebook, you can tag the picture to the Witch Eyes series page, and I’ll create a whole little album for pictures of the book in the wild. You will also win a signed copy of THE GODDESS TEST by Aimée Carter, and a signed copy of SIRENZ by Charlotte Bennardo and Natalie Zaman. And a whole lot of swag. I’ve been thinking a lot about bad juju the last couple of days. 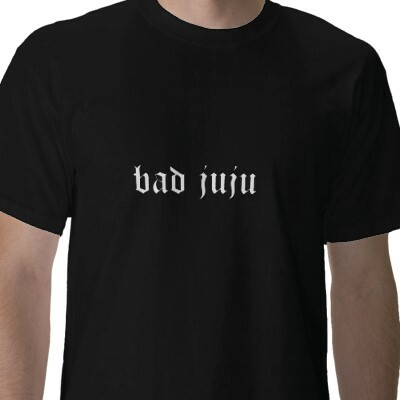 One definition of bad juju is basically the idea that you can get stuck into a pattern of bad luck and misfortune that will continue on until you ‘break’ it. And when you don’t, everything you do comes out bad or tainted. Bad juju. Some people have rituals they perform to wipe the slate clean (on Grey’s Anatomy they drank hot chocolate or something). This week has been crazy with the ups and downs (both online and not online), and I’m always horrible at focusing when crazy stuff is going on. I had a laundry list of things I need to finish, and I haven’t even STARTED. And even now, I sat down to work this morning, and I’ve got about as much concentration skills as Leah after her second pot of coffee. So how do you break the routine? I used to do the ‘sit with a mug of hot tea’ thing. Veg out, embrace the day, whatever you want to call it. I’ll break out my DS and play video games for a little while until the ADD eases up. Breaking up the routine by going out to breakfast, or shopping, or anything like that. Sitting outside for awhile (which I’m not doing because it’s -14 degrees outside today). What about you? How do you break up a bout of bad juju? I’ve had a few people tweet me or send me messages telling me that they can’t find Witch Eyes in stores. It happens. There’s limited shelf space, buyers don’t pick up a book, etc. It happens. But most stores will pick up at least a couple of copies if you ask. So the next time you’re out, if they DON’T have it, consider asking them to pick up a few copies. I’ll be your best friend! Or if you want to help from home, call your local bookstore and ask them to carry it. Summary: A devastated Earth’s last hope is found in Pearls: small, mysterious orbs that fall from space and are capable of supplying enough energy to power entire cities. 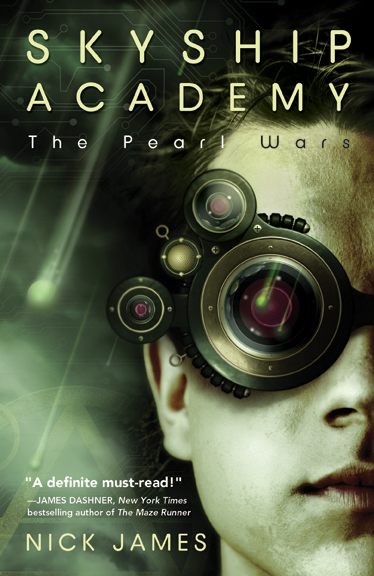 Battling to control the Pearls are the Skyship dwellers—political dissidents who live in massive ships in the Earth’s stratosphere—and the corrupt Surface government. My Thoughts: By now, you guys know how I am about the cover. And this cover, I love it. It gives you SUCH a great sense of the book. Flux covers are really great at evoking an atmosphere like that. The story was interesting, because right from the bat it’s a split POV, but one is in 1st person, the other in 3rd. It was an interesting choice, and one of the many things about the book that I didn’t see coming. Skyship Academy has an almost effortless sense of worldbuilding. I’m frankly jealous, because Nick has created such a complex world, but everything is easy and relate-able. There’s a deliberate sense of control with the terminology – even the slang made sense and came across easy. The plot was VERY fast paced, which I’m a huge fan of, and it built towards a climax that I definitely didn’t see coming. I know, I know, you’re sick of hearing me talk about The Secret Circle. I promise, it won’t be much longer now. 😉 But c’mon, a show about witches in Washington with evil parents? Someone was peaking at WITCH EYES when they were redesigning the show, I swear.